A while ago I found a huge jar of chia seeds at Walgreen’s. Without fully realizing how expensive chia seeds usually are, I bought the jar for $5.99. A few days later, perusing the aisles at our local Jewel grocery store, I found the exact same jar for $17.99. Yes! I couldn’t believe it and thought I had found the steal of the century – from then on, I would only buy my chia seeds at Walgreen’s. Just today, however, I went back to Walgreen’s to stock up on more chia seeds. Lo and behold, not a single person in that store knew what I was talking about. “Chia seeds? Like for the chia pet? We only get those around Christmas.” That must be it – I must have bought that jar around Christmas. But really? Now I cannot buy my jar of $5.99 chia seeds? Guess I won’t be making this recipe again until next Christmas… which is really a shame because it’s so darn good! 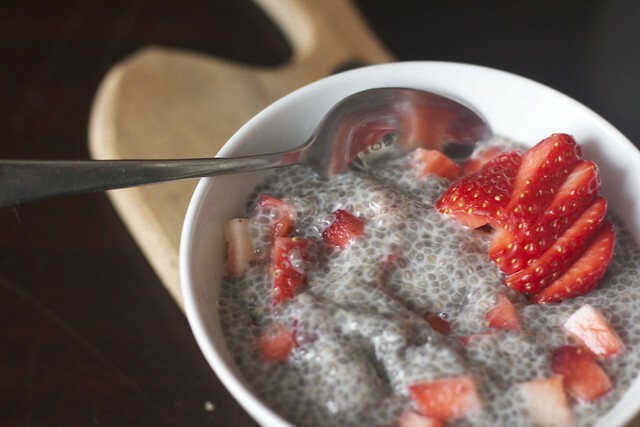 If you’re new to chia seeds, they create a gel when submerged in liquid. 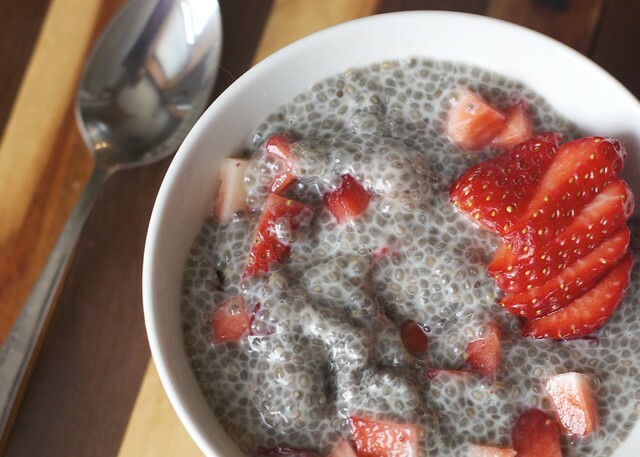 The gel can either be really gross, or you can use it to your advantage and make this tapioca pudding-like concoction. Super healthy and perfect as either breakfast or dessert! Play around with zest combos – lemon, lime, orange, or others – and try different fruits on top, too. And stock up on chia seeds around Christmas time! Combine all ingredients in a 1-quart mason jar (or two smaller mason jars) and shake well to combine. Let sit in the fridge for at least 4 hours or overnight, stirring and reshaking the mixture every once in a while. Serve with fresh cut fruit.